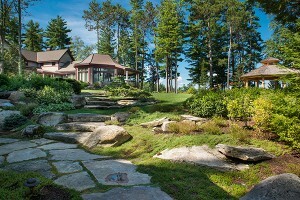 The bell-shaped, main house addition, as viewed from the new boathouse, is framed by new hardscape and extensive native and ornamental plantings, including dwarf evergreens. 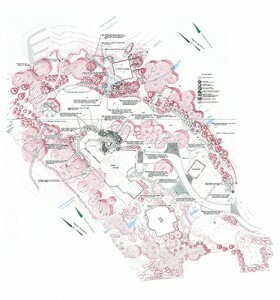 The conceptual master plan illustrates how the site was designed to combine technically three lots of record into one, cohesive property. This “before” picture shows the secluded nature of the site. 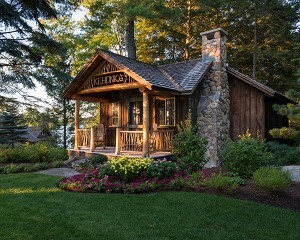 The historic cabin was integrated into the design, while the house in the background was removed to open lake views. The view created by the house removal: The stone wall defined the old property line; stakes represent new elements. Mulch, hay bales and silt layers protect the lake’s water quality. 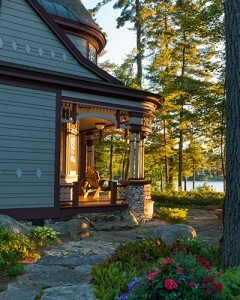 This “after” picture highlights the vista to the pavilion framed by mature, existing vegetation. 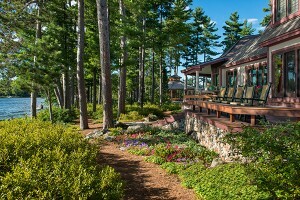 A new cabin porch, along with extensive plantings, help connect the structure to the new landscape. This “before” photo shows how project elements were laid out using mockups prior to client approval. It also depicts the mulch that covered exposed soil, to prevent stormwater runoff. This “after” image shows the new grade sweeping up to the addition, helping connect the two properties. Mature dwarf evergreens and low plantings ensure panoramic views from the addition. The pavilion and stairs enhance the newly created views. The pavilion was positioned to block objectionable views beyond, while creating a focal point in the foreground. 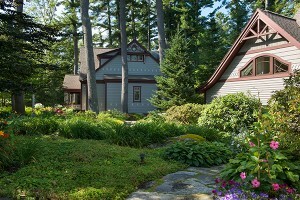 Perennials, annuals and woody ornamentals nestle the historic cabin into the site. The boathouse is tucked entirely into the shoreline to minimize visual impact. 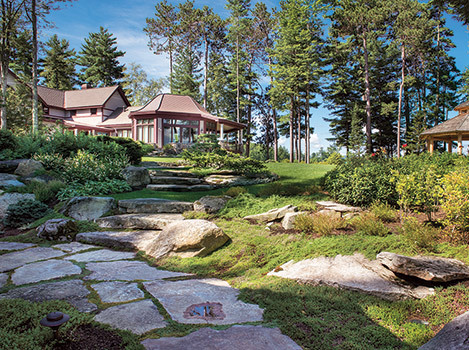 On the arrival side of the house, the same native, flat stone used elsewhere creates pathways that connect the landscapes of the main house and the guesthouse in the background. The guesthouse was designed to feel like an old structure, with the newer main house in the background. The arrival area contains a cutting garden, drawing attention to the front entry. 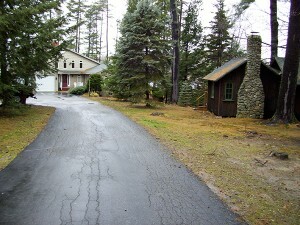 The property is at the end of a public cul-de-sac. 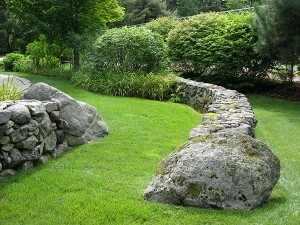 A bypass wall was constructed to gives the illusion of a solid wall from the road. Stone walkways and steps transition grade and move users to the lakeside environment. The mature trees around the structures have lightning protection, while low-voltage pathlights and downlights illuminate the walks. 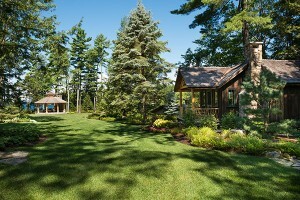 On the lake side of the main house, a pine needle-covered walkway separates the more manicured landscape from the natural shoreland landscape. A “pondless” water feature helps transition grade and provides soothing white noise between the two cut granite patios. A large, single-stone counter surrounds the grill. COMPANY: Pellettieri Associates, Warner, N.H. THE DETAILS: When the client purchased an adjacent property, the challenge for Pellettieri Associates was to create a landscape that integrated the newly acquired lot with the original lot. First, the team calculated the area needed for each lot to accommodate an addition to the main house, while meeting the requirements for New Hampshire’s Shoreland Water Quality Protection Act. A lot line adjustment was granted at the local level, providing the parameters for the design. 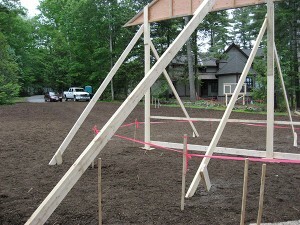 Before the main house addition was built, a large platform was built at its exact height and location. 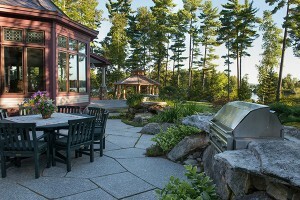 From this, the client was able to view mock-ups of the patios, pavilion, boathouse and other site elements. While the effort added a significant amount of time to the project, a time and materials contract provided flexibility necessary for the extra measures. 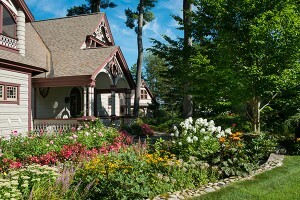 This project also earned a National Landscape Awards of Excellence Grand Award from the Professional Landcare Network.